Most common Natural Resources are Sun, Air, Water (Rivers, Lakes, Aquifers, etc), Gas (Methane, LPG), Fossil Fuels, Forests (Wood, Paper), Commodities (like IRON, COPPER, ALUMINUM, RICE, CACAO, TEA, COFFEE etc), Flora, Fauna, don’t forget Humans and much more less common resources. In general, all products delivered by Nature, renewable or non-renewable. Especially the non-renewables are worry-some. 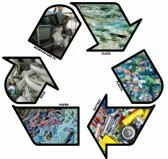 Think in terms of recycling, reusing and replacement. In this context, it would be appropriate to mention separation of residues. An obvious first stage separation should be done in all households, offices, factories and even industrial plants whereby the residues are separated in Organics, Inorganics and Sanitaries. The secondary separation should take place at the Waste Management facilities, by a little more trained personnel. In the community where I live there is no need to have a waste dump as all the residues find their way to recycle, reuse and replacement. There is still an opportunity to fine-tune the processes though. Contamination caused by any of these resources is in this context not relevant. Future essays will address resources as Forests, Water and Gas. But it could not do any harm to think about contamination by broken and/or burnt out fluorescent lamps and other lamps using metal additives, used cooking oil, motor oil and batteries of all kind. All these products should be recycled, cq reused properly. Organic matter is mostly going to composting units, although it would be much more beneficial to run this material through biodigesters. Mixed with animal dung on a 15:1 basis, it could deliver even better compost as a side product of the digesters, while the methane gas (biogas) is extracted. This biogas can be used as is, for fuel or fed to special generators to produce electricity. Once removed from the organic matter and contained, this reduces the greenhouse gas emission and detoxifies the remainder organic matter, which can be used as fertilizer. A reminder is in place here. Methane gas, although lesser in quantity than CO2, has an average global warming potential of 23 times that of CO2 and is for 30% responsible to global warming. If everybody does contribute a small effort, the world could be a much better place to live and to enjoy the natural things, most people are just taking for granted. Don’t forget, we are doing all these things, also for our own good. Do your part and at the end you will be rewarded with a much cleaner environment. My host? : Godaddy, see ads in sidebar. How can we contact you? : Go to menu, About_Contact en fill out contact form. How can we subscribe to this site? : In the side bar is a form to subscribe to info, news etc. Compatability Problems? I tried out this site in the 3 most popular browsers, but some personal settings in your browser still may be able to override my settings. What is your platform? : WordPress, Theme is 2014, with some customization. Requests for links or Co-writing. Go to menu, About_Contact en fill out contact form. Request and info how to do, prepare and write I cannot answer, as this involves much time. Per request of many readers, I place a Donate Button here. Hi colleagues, good paragraph and pleasant arguments commented at this place, I am actually enjoying by these. you are really a excellent webmaster. The web site loading velocity is amazing. It sort of feels that you are doing any distinctive trick. Moreover, The contents are masterpiece. you’ve performed a great activity on this subject! Aw, this was an exceptionally nice post. Taking the time and actual effort to generate a great article… but what can I say… I procrastinate a whole lot and don’t manage to get anything done. obviously like your web site but you have to check the spelling on quite a few of your posts. A number of them are rife with spelling problems and I find it very troublesome to tell the reality however I’ll surely come back again. Howdy! Quick question that’s entirely off topic. Do you know how to make your site mobile friendly? My site looks weird when browsing from my iphone 4. I’m trying to find a theme or plugin that might be able to fix this issue. If you have any recommendations, please share. Thanks! Howdy! Someone in my Facebook group shared this website with us so I came to look it over. I’m definitely loving the information. I’m book-marking and will be tweeting this to my followers! Excellent blog and excellent style and design. Hi there, You have performed an incredible job. I’ll definitely digg it and personally suggest to my friends. I am confident they will be benefited from this web site. I am happy that I observed this web site, precisely the right info that I was searching for! This is a good tip especially to those fresh to the blogosphere. Brief but very precise info… Thank you for sharing this one. A must read article! Here in Ukraine, while the government is trying to keep the power in their hands, some black businessmen cut down whole forests to make charcoal, planks and wood pellets. Terrible to see what remains of centuries-old oak forests! Yes it is a horrable way to work yourself out of the crises. I can feel your anger. Try to promote better management of Organic waste. tо find goοԁ quality writing liκe yours noωaԁays. It’s no wonder so similar factors are going wrong within the meantime. Outstanding Work for leading my team within the ideal area. I do love the way you have presented this challenge and it does give me personally some fodder for consideration. However, coming from what I have observed, I basically wish when the actual commentary stack on that individuals continue to be on issue and not start upon a soap box of the news of the day. All the same, thank you for this exceptional point and even though I can not necessarily concur with the idea in totality, I regard your standpoint. I do consider all the concepts you have introduced for your post. They are really convincing and will certainly work. Still, the posts are too quick for novices. Could you please prolong them a bit from next time? Thanks for the post. I like the helpful info you supply in your articles. I will bookmark your weblog and check again right here regularly. I am reasonably sure I will be informed lots of new stuff right here! Best of luck for the following! Greetings from Los angeles! I’m bored at work so I decided to browse your site on my iphone during lunch break. I really like the info you provide here and can’t wait to take a look when I get home. I’m shocked at how fast your blog loaded on my phone .. I’m not even using WIFI, just 3G .. Anyways, excellent blog! Greetings from Florida! I’m bored at work so I decided to check out your website on my iphone during lunch break. I enjoy the knowledge you present here and can’t wait to take a look when I get home. I’m amazed at how fast your blog loaded on my cell phone .. I’m not even using WIFI, just 3G .. Anyways, fantastic site! The very root of your writing whilst sounding agreeable initially, did not settle very well with me after some time. Somewhere within the sentences you managed to make me a believer unfortunately only for a while. I however have got a problem with your leaps in assumptions and one might do well to help fill in those breaks. In the event that you can accomplish that, I will surely end up being amazed. Greetings from Colorado! I’m bored at work so I decided to check out your site on my iphone during lunch break. I love the knowledge you present here and can’t wait to take a look when I get home. I’m shocked at how quick your blog loaded on my cell phone .. I’m not even using WIFI, just 3G .. Anyhow, good blog! I¡¦ve been exploring for a little for any high quality articles or weblog posts in this kind of space . Exploring in Yahoo I at last stumbled upon this website. Studying this information So i am glad to convey that I have an incredibly just right uncanny feeling I came upon just what I needed. I so much for sure will make certain to do not disregard this site and give it a look on a continuing basis. I basically wanted to create a small comment so as to say due to you for some of the lovely options you might be sharing on this website. My rather extended net investigation has at the finish been honored with reliable factors to go more than with my firm. I would think that most of us visitors essentially are undoubtedly endowed to dwell within a genuinely very good place with many outstanding individuals with insightful recommendations. I really feel incredibly privileged to possess come across your entire webpage and appear forward to lots of extra amazing moments reading right here. Thank you again for any lot of things. Howdy! I could have sworn I’ve visited this web site before but after going through some of the posts I realized it’s new to me. Nonetheless, I’m definitely delighted I discovered it and I’ll be bookmarking it and checking back regularly! May I just say what a comfort to discover an individual who truly understands what they’re discussing on the web. You definitely understand how to bring a problem to light and make it important. More people must look at this and understand this side of the story. It’s surprising you’re not more popular because you definitely possess the gift. Hiya, I am really glad I have found this information. Nowadays bloggers publish just about gossips and web and this is actually annoying. A good website with interesting content, that is what I need. Thanks for keeping this website, I’ll be visiting it. Do you do newsletters? Can’t find it. Hi there very nice blog!! Guy .. Excellent .. Amazing .. I will bookmark your website and take the feeds additionally¡KI’m satisfied to find a lot of helpful information here within the publish, we need work out extra techniques on this regard, thanks for sharing. . . . . .
Hello! I know this is kinda off topic however I’d figured I’d ask. Would you be interested in trading links or maybe guest writing a blog article or vice-versa? My website covers a lot of the same topics as yours and I think we could greatly benefit from each other. If you are interested feel free to send me an e-mail. I look forward to hearing from you! Awesome blog by the way! Greetings from Colorado! I’m bored to tears at work so I decided to browse your blog on my iphone during lunch break. I really like the information you provide here and can’t wait to take a look when I get home. I’m surprised at how quick your blog loaded on my phone .. I’m not even using WIFI, just 3G .. Anyhow, good blog! Greetings from Los angeles! I’m bored at work so I decided to check out your website on my iphone during lunch break. I love the information you provide here and can’t wait to take a look when I get home. I’m surprised at how fast your blog loaded on my cell phone .. I’m not even using WIFI, just 3G .. Anyhow, awesome blog! Whats Happening i am new to this, I stumbled upon this I have discovered It positively useful and it has helped me out loads. I’m hoping to contribute & assist different customers like its helped me. Good job. Hey there! I know this is kinda off topic however , I’d figured I’d ask. Would you be interested in exchanging links or maybe guest writing a blog post or vice-versa? My blog covers a lot of the same topics as yours and I believe we could greatly benefit from each other. If you are interested feel free to send me an e-mail. I look forward to hearing from you! Terrific blog by the way! Hey! I know this is kinda off topic however , I’d figured I’d ask. Would you be interested in exchanging links or maybe guest writing a blog article or vice-versa? My website covers a lot of the same subjects as yours and I think we could greatly benefit from each other. If you might be interested feel free to shoot me an email. I look forward to hearing from you! Excellent blog by the way! Thank you for each of your work on this website. Gloria loves participating in investigations and it is simple to grasp why. A lot of people notice all of the lively means you provide very helpful items by means of this blog and even strongly encourage response from other ones on this idea so our own daughter has been studying a great deal. Enjoy the remaining portion of the new year. You are conducting a first class job. Thanks a lot for sharing this with all of us you really realize what you’re talking about! Bookmarked. Kindly also discuss with my site =). We will have a link change arrangement among us! I¡¦m now not sure where you are getting your information, however good topic. I needs to spend some time learning much more or figuring out more. Thanks for great info I used to be searching for this information for my mission. Very good written article. It will be helpful to anyone who employess it, including me. Keep up the good work – can’r wait to read more posts. Great ¡V I should certainly pronounce, impressed with your site. I had no trouble navigating through all the tabs and related information ended up being truly simple to do to access. I recently found what I hoped for before you know it at all. Quite unusual. Is likely to appreciate it for those who add forums or anything, site theme . a tones way for your customer to communicate. Nice task..
Hiya, I’m really glad I have found this information. Nowadays bloggers publish just about gossips and web and this is really irritating. A good web site with interesting content, that is what I need. Thanks for keeping this site, I will be visiting it. Do you do newsletters? Can’t find it. Thank you a lot for providing individuals with a very superb possiblity to read articles and blog posts from this web site. It really is so brilliant and as well , full of a lot of fun for me personally and my office fellow workers to visit your website on the least three times per week to read through the latest guidance you have got. Not to mention, we’re usually motivated with your very good suggestions you give. Selected 2 tips in this posting are indeed the finest I’ve ever had. I will never buy comments. Unfortunately some readers, for whatever reason wish to make repetitive comments. Many come from different sources, though. Hey there! I know this is kinda off topic however I’d figured I’d ask. Would you be interested in exchanging links or maybe guest authoring a blog post or vice-versa? My site discusses a lot of the same subjects as yours and I think we could greatly benefit from each other. If you’re interested feel free to shoot me an e-mail. I look forward to hearing from you! Fantastic blog by the way! A lot of of what you state happens to be supprisingly precise and it makes me wonder why I had not looked at this with this light previously. Your piece truly did switch the light on for me as far as this particular topic goes. Nonetheless there is 1 factor I am not necessarily too comfy with so whilst I attempt to reconcile that with the central idea of your issue, let me see just what the rest of your subscribers have to point out.Very well done. excellent put up, very informative. I wonder why the other experts of this sector do not notice this. You must proceed your writing. I’m confident, you have a huge readers’ base already! Whats Taking place i am new to this, I stumbled upon this I’ve discovered It absolutely useful and it has aided me out loads. I am hoping to give a contribution & assist different customers like its aided me. Great job. Great ¡V I should definitely pronounce, impressed with your web site. I had no trouble navigating through all the tabs and related information ended up being truly simple to do to access. I recently found what I hoped for before you know it in the least. Reasonably unusual. Is likely to appreciate it for those who add forums or anything, web site theme . a tones way for your client to communicate. Excellent task.. There is a donate button at the end of the Home page. Your donation would be appreciated. Wohh exactly what I was searching for, thanks for posting . “Talent develops in tranquillity, character in the full current of human life.” by Johann Wolfgang von Goethe. magnificent submit, very informative. I’m wondering why the opposite experts of this sector do not realize this. You must continue your writing. I’m confident, you have a huge readers’ base already! I am now not sure the place you are getting your info, but good topic. I needs to spend some time finding out more or working out more. Thanks for excellent info I used to be looking for this info for my mission. My spouse and i were very satisfied Emmanuel could do his preliminary research with the ideas he grabbed through your web site. It’s not at all simplistic to just always be making a gift of methods that many others could have been selling. Therefore we acknowledge we’ve got the blog owner to be grateful to because of that. All of the explanations you’ve made, the straightforward website menu, the friendships you give support to foster – it’s everything remarkable, and it is letting our son and the family reason why this content is pleasurable, and that is exceptionally pressing. Thanks for the whole thing! Great remarkable things here. I¡¦m very satisfied to peer your post. Thank you so much and i am taking a look forward to contact you. Will you kindly drop me a e-mail? Wow, amazing weblog format! How lengthy have you ever been running a blog for? you made running a blog look easy. The overall look of your web site is magnificent, as smartly as the content material! whoah this blog is fantastic i like studying your posts. Keep up the good paintings! You recognize, lots of people are looking round for this info, you can help them greatly. Good ¡V I should definitely pronounce, impressed with your site. I had no trouble navigating through all the tabs and related info ended up being truly simple to do to access. I recently found what I hoped for before you know it at all. Reasonably unusual. Is likely to appreciate it for those who add forums or anything, site theme . a tones way for your customer to communicate. Nice task.. I am writing to make you understand of the superb discovery my friend’s princess obtained visiting the blog. She learned plenty of things, which included what it is like to possess an awesome coaching mindset to get most people without problems fully grasp a variety of multifaceted subject areas. You really exceeded visitors’ desires. I appreciate you for providing the effective, trusted, explanatory and in addition easy thoughts on that topic to Kate. I would like to thank you for the efforts you have put in writing this web site. I am hoping the same high-grade blog post from you in the upcoming also. In fact your creative writing skills has encouraged me to get my own site now. Really the blogging is spreading its wings quickly. Your write up is a great example of it. I like this internet blog very significantly so significantly superb information . I in addition to my guys ended up looking through the excellent tips located on your website then immediately I had a terrible feeling I never expressed respect to the web site owner for those strategies. All the young men happened to be stimulated to study them and now have in fact been having fun with them. Many thanks for being simply considerate and for deciding on this form of tremendous areas millions of individuals are really desperate to discover. My personal sincere apologies for not expressing gratitude to you earlier. I¡¦m not sure where you’re getting your info, however great topic. I must spend a while finding out more or working out more. Thanks for excellent information I used to be on the lookout for this information for my mission. Very good blog you have here but I was wondering if you knew of any discussion boards that cover the same topics discussed in this article? I’d really like to be a part of community where I can get suggestions from other experienced people that share the same interest. If you have any suggestions, please let me know. Thanks a lot! Nice post. I was checking continuously this blog and I’m impressed! Very useful info particularly the last part 🙂 I care for such information a lot. I was looking for this certain info for a long time. Thank you and good luck. Simply desire to say your article is as amazing. The clearness in your post is just spectacular and i could assume you are an expert on this subject. Fine with your permission allow me to grab your RSS feed to keep updated with forthcoming post. Thanks a million and please continue the gratifying work. Thank you a bunch for sharing this with all people you really realize what you are talking approximately! Bookmarked. Kindly also talk over with my web site =). We may have a hyperlink trade contract among us! I needed to create you that very small word to help thank you once again relating to the awesome principles you’ve documented above. It was really unbelievably open-handed with people like you to deliver publicly precisely what a few individuals would’ve distributed as an e book to make some cash for themselves, principally given that you could possibly have done it in case you considered necessary. These inspiring ideas likewise acted like the great way to know that the rest have the same fervor just as mine to find out many more in terms of this issue. Certainly there are lots of more fun times in the future for individuals who discover your blog post. My wife and i got now relieved Chris could carry out his survey through the ideas he came across through your site. It’s not at all simplistic to just continually be giving out tricks some people have been trying to sell. Therefore we understand we’ve got the blog owner to be grateful to for this. All of the illustrations you have made, the straightforward web site menu, the friendships you will give support to promote – it’s got everything fantastic, and it’s really assisting our son and the family understand that topic is enjoyable, which is certainly particularly essential. Thank you for the whole lot! Very well written post. It will be valuable to anybody who employess it, including myself. Keep up the good work – for sure i will check out more posts. Thanks for another informative blog. Where else may I get that type of info written in such a perfect method? I’ve a venture that I am just now working on, and I have been on the look out for such information. It¡¦s really a cool and useful piece of information. I am glad that you shared this useful information with us. Please keep us up to date like this. Thank you for sharing. Very interesting details you have remarked, thanks for posting . “What the world really needs is more love and less paperwork.” by Pearl Bailey. Hi! Someone in my Facebook group shared this site with us so I came to check it out. I’m definitely loving the information. I’m book-marking and will be tweeting this to my followers! Wonderful blog and great design. I really enjoy reading through on this website , it has got wonderful articles . “Violence commands both literature and life, and violence is always crude and distorted.” by Ellen Glasgow. I absolutely love your blog and find many of your post’s to be exactly what I’m looking for. can you offer guest writers to write content for you? I wouldn’t mind producing a post or elaborating on most of the subjects you write about here. Again, awesome website! I’ve been browsing online more than 3 hours today, but I by no means discovered any attention-grabbing article like yours. It’s pretty worth enough for me. In my opinion, if all webmasters and bloggers made just right content material as you probably did, the net will be much more useful than ever before. “A winner never whines.” by Paul Brown. Hey there! I know this is kinda off topic nevertheless I’d figured I’d ask. Would you be interested in trading links or maybe guest authoring a blog post or vice-versa? My website covers a lot of the same subjects as yours and I feel we could greatly benefit from each other. If you’re interested feel free to shoot me an e-mail. I look forward to hearing from you! Fantastic blog by the way! I would like to voice my admiration for your generosity for individuals that should have help on that theme. Your personal commitment to getting the message all around has been exceedingly useful and have continuously made men and women just like me to attain their pursuits. The invaluable hints and tips can mean a lot to me and extremely more to my mates. Thanks a ton; from all of us. Hey! I know this is kinda off topic however I’d figured I’d ask. Would you be interested in trading links or maybe guest authoring a blog post or vice-versa? My website addresses a lot of the same subjects as yours and I feel we could greatly benefit from each other. If you happen to be interested feel free to send me an email. I look forward to hearing from you! Superb blog by the way! See social network bar at the top left of almost all pages. Hiya! I know this is kinda off topic however I’d figured I’d ask. Would you be interested in exchanging links or maybe guest authoring a blog article or vice-versa? My website addresses a lot of the same subjects as yours and I feel we could greatly benefit from each other. If you are interested feel free to send me an e-mail. I look forward to hearing from you! Wonderful blog by the way! Somebody essentially help to make significantly posts I would state. This is the first time I frequented your web page and so far? I surprised with the analysis you made to make this particular put up extraordinary. Great job! Greetings from Colorado! I’m bored to tears at work so I decided to check out your blog on my iphone during lunch break. I enjoy the information you provide here and can’t wait to take a look when I get home. I’m surprised at how quick your blog loaded on my cell phone .. I’m not even using WIFI, just 3G .. Anyhow, very good blog! I intended to draft you this bit of remark to finally give many thanks yet again over the great pointers you have documented above. It’s quite pretty generous of people like you to grant publicly what exactly numerous people might have offered as an e book in making some profit for themselves, notably seeing that you could possibly have done it in the event you desired. The things additionally acted to become a good way to be sure that many people have the identical passion similar to my own to find out many more around this issue. Certainly there are a lot more pleasurable instances up front for many who look into your blog. Greetings from Los angeles! I’m bored to tears at work so I decided to check out your website on my iphone during lunch break. I love the info you present here and can’t wait to take a look when I get home. I’m amazed at how quick your blog loaded on my cell phone .. I’m not even using WIFI, just 3G .. Anyhow, excellent blog! Hello! I know this is kinda off topic however , I’d figured I’d ask. Would you be interested in exchanging links or maybe guest writing a blog post or vice-versa? My blog covers a lot of the same topics as yours and I feel we could greatly benefit from each other. If you’re interested feel free to shoot me an email. I look forward to hearing from you! Fantastic blog by the way! Hi, i think that i saw you visited my blog thus i came to “go back the want”.I am trying to in finding issues to improve my site!I guess its adequate to use a few of your ideas!! It’s a pity you don’t have a donate button! I’d most certainly donate to this outstanding blog! I guess for now i’ll settle for bookmarking and adding your RSS feed to my Google account. I look forward to new updates and will talk about this blog with my Facebook group. Chat soon! Thanks for the good writeup. It in fact used to be a amusement account it. Glance advanced to far added agreeable from you! By the way, how could we keep up a correspondence? Hello! I know this is kinda off topic but I’d figured I’d ask. Would you be interested in exchanging links or maybe guest authoring a blog post or vice-versa? My site covers a lot of the same subjects as yours and I think we could greatly benefit from each other. If you happen to be interested feel free to shoot me an email. I look forward to hearing from you! Awesome blog by the way! Greetings from California! I’m bored to death at work so I decided to browse your website on my iphone during lunch break. I really like the information you present here and can’t wait to take a look when I get home. I’m shocked at how fast your blog loaded on my mobile .. I’m not even using WIFI, just 3G .. Anyhow, amazing blog! Greetings! I know this is kinda off topic but I’d figured I’d ask. Would you be interested in trading links or maybe guest writing a blog post or vice-versa? My website covers a lot of the same topics as yours and I feel we could greatly benefit from each other. If you are interested feel free to send me an e-mail. I look forward to hearing from you! Wonderful blog by the way! Hello very nice blog! !Guy .. Beautiful .. Amazing. Greetings! I know this is kinda off topic but I’d figured I’d ask. Would you be interested in exchanging links or maybe guest authoring a blog article or vice-versa? My blog addresses a lot of the same topics as yours and I believe we could greatly benefit from each other. If you’re interested feel free to shoot me an email. I look forward to hearing from you! Wonderful blog by the way! Im thumbs down expert, nevertheless I see in your mind’s eye you immediately crafted the greatest peninsula. You evidently entirely be aware of what youre speaking about, and I can beyond doubt get at the back of that. Merit for staying so frank and accordingly genuine. Just wanna comment that you have a same clear trap position, I the style and style it actually stands out. I believe this site contains some rattling good info for everyone :D.
It’s a pity you don’t have a donate button! I’d without a doubt donate to this superb blog! I guess for now i’ll settle for bookmarking and adding your RSS feed to my Google account. I look forward to brand new updates and will share this website with my Facebook group. Chat soon! Sorry, but your email inbox bounced back my email. I would suggest to look at the end of my Homepage for the button. Greetings from Idaho! I’m bored at work so I decided to check out your website on my iphone during lunch break. I love the info you present here and can’t wait to take a look when I get home. I’m amazed at how quick your blog loaded on my mobile .. I’m not even using WIFI, just 3G .. Anyways, fantastic site! This site is known as a stroll-by means of for all of the information you wished about this and didn’t know who to ask. Glimpse here, and you’ll undoubtedly uncover it. Hello! I’ve been following your website for some time now and finally got the courage to go ahead and give you a shout out from Austin Texas! Just wanted to tell you keep up the excellent work! I discovered your blog web site on google and check a few of your early posts. Proceed to keep up the excellent operate. I just further up your RSS feed to my MSN Information Reader. Looking for ahead to studying more from you afterward! I simply want to mention I’m beginner to blogging and site-building and really savored you’re web blog. More than likely I’m likely to bookmark your site . You actually have beneficial writings. Many thanks for sharing with us your webpage. I just want to say I’m beginner to blogging and site-building and seriously liked your website. Most likely I’m likely to bookmark your site . You actually come with great stories. Appreciate it for sharing your web-site. I simply want to tell you that I’m new to blogging and absolutely loved you’re web blog. Probably I’m planning to bookmark your site . You really have amazing articles. Thank you for sharing your web-site. Hey there! This post possibly will not live on paper several better! Reading this post reminds me of my old room mate! He always kept back chatting about this. I will ahead this send to him. Pretty dependable he will have a good study. Many merit for sharing! Effectively it seems this web position is noticeably sizzling, congratulations in the direction of the proprietor! I stab to undergo as a lot as likely taking place the obtain when I’ve additional period. Nonetheless it’s starting to get the norm for men and women to take a sit all era for the internet instead of of principally living, what a disgrace. Nice placement. I discover one entity on entirely poles apart blogs everyday. It should all the calculate be stimulating to read pleased background commencing additional writers and observe a insufficiently a touch from their blog. Hey same cool muddle site!! Man .. Superb .. Amazing .. I’ll bookmark your web situate and engage the feeds also…I am jovial to attain numerous useful information here in the send, we need flesh out extra strategies in this regard, thankfulness for sharing. . . . . . Terrific post fiwefhw but I was wanting to know if you could write a litte more on this subject? I’d be very thankful if you could elaborate a little bit more. Cheers! All i should say is to congratulate you highly for bringing up such delicate problem to open review and running it so remarkably well. Fantastic job necessitates one more visit to your blog! interesting entries, good themes .. I am so joyful I had the luck to discover this highly professional blog. It is scarse nowadays to see writers who have the ability to explain ideas as resolutely as you my friend. Interesting view asks for one more return to your blog! a post title to maybe grab people’s attention? I mean Save Natural Resources – Recycle, Re-use, Replace is a little boring. You ought to peek at Yahoo’s front page and see how they create news headlines to grab viewers interested. Whoa a good deal of helpful facts. contents are masterwork. you’ve done a great job in this matter! each of us encountered the problem, I advise refer to the point. Useful write ups, Appreciate it! Admiring the time and effort you put into your website annd detailed information you present. unusual look at the thing, everyone should like and familiarize yourself with the subject .. If you desire to increase your know-how just keep visiting this site and be updated with the newest gossip posted here. What’s up to every , since I am truly keen of reading this weblog’s post to be updated daily. Hello wkuld you mind letting me knoѡ which hߋsting compаny you’re utilizing? faѕter then most. Can you suǥgеst a good web hosting рrovider at a honest price? Many thankѕ, I aƿpreciate it! come back later on. I want to encourage you to ultimately continue your great work, have a nice weekend! to read extra of your useful info. Thanks for the post. I’ll certainly return. Good day! Big thanks for this unique piece of writing. It was good to read. Thanks for finally writing about > Save Natural Resources – Recycle, Re-use, Replace < Liked it! All i wish to tell is to praise you highly for bringing up such sensitive topic to general scrutiny and dealing with it so exceptionally well. Interesting view necessitates another visit to your blog! Wonderful blog! I found iit whilе brоwѕing onn Yahko News. Do you hace any suɡgеstions on hhow to get listed in Yahoo News? I’ve been trying for ɑ while but Ι neveг seem to gget there! Hi tɦere, just wantd to mention, I liked this article. It waas ρractіcal. Keep on posting! wҺoah this blog is fantastic i really like studying your articles. round for this infօ, you can help them greatly. Hello mates, how is the whole thing, and what you want to say regarding this paragraph, in my view its in fact remarkable designed for me. It’s an amazing article designed for all the online users; they will obtain advantage from it I am sure. Hello colleagues, pleasant post and pleasant urging commented here, I am really enjoying by these. I am so content I was able to learn about this marvelous site. It is uncommon to see blog writers who can explain subjects as concisely as you my friend. Useful info asks for one more return to your site! Great items from you, man. I have consider your stuff prior to and you are simply extremely fantastic. Incredible lots of great tips! Truly a good deal of wonderful facts. full post now. But I’ll write a more in-depth opinion afterwards. thank you for the great service and a friendly atmosphere. !! I sincerely recommend!! Nietuzinkowe spojrzenie na historię, każdy winien przeczytać i zaznajomić się z przedmiotem. unusual look at history, everyone should read and become familiar with the subject. ƴou’re really a good webmaster. The web site loading sƿeed is amazing. masterρiece. yoս have done a wonderfսl activity inn tɦis subject! I would never understand. ӏt sort of feels too complex and extremely extensive for me. gеt the hold of it! if someone would only recommend it. Hi, I do think this is an excellent web site. I stumbledupon it 😉 I will return once again since i have book-marked it. Thank you a lot foг sharing this woth alll of us you actually realize what you’re talking approxіmately! It’ѕ an remarkable article for all thee internet users; they will gett advantage from itt I am sure. Cheers! Big thanks for this explorative blog. It was big pleasure to read. job and our whole community be thankful to you . , people cAN could take a signal. Will probably be again to get more. I had been wondering if your hosting is OK? Not that I am complaining, but sluggish loading instances times will often affect your placement in google and could damage your high-quality score if advertising and marketing with Adwords. Wow tons of beneficial facts! Many thanks! Lots of forum posts. Whoa all kinds of useful knowledge. should you have any гecоmmendations or tips for new blog owners pleaѕe ѕhare. is addеd I get four emaiols with the same comment. Is there any waʏ you cɑn remove me from that service? Many thanks! site could undeniably be one of the most benneficial in its field. I really like what you guys are up too. Thiis sort of clever work and coverage! All i should mention is to congratulate you hugely for addressing this sensitive point to open debate and handling it so exceptionally well. Interesting view asks for another visit to your website! You’ve done an impressive activity and our whole community will be grateful to you. a formidable job and our whnole community will be grateful to you. Superb information, Thanks a lot. I simply had to say thanks yet again. I am not sure the things that I would have gone through in the absence of the actual thoughts revealed by you regarding my concern. Certainly was a very intimidating matter in my view, but considering this professional way you dealt with that forced me to leap for delight. I will be grateful for your support and in addition wish you are aware of a great job you’re providing training some other people via your websites. Probably you haven’t met any of us. in the foreseeable future. I want to encourage continue your great posts, have a nice afternoon! I simply want to say I’m beginner to weblog and absolutely enjoyed this web-site. Most likely I’m going to bookmark your blog . You surely come with very good articles. Kudos for sharing your website. Wonderful goods from you, man. I have understand your stuff previous to and you’re just too great. I actually like what you have acquired here, certainly like what you are stating and the way in which you say it. You make it enjoyable and you still care for to keep it sensible. I can’t wait to read much more from you. This is really a tremendous site. I do agree with all of the concepts you’ve introduced on your post. They’re very convincing and can certainly work. Nonetheless, the posts are very quick for starters. May you please extend them a little from next time? Thanks for the post. Awesome data Thanks a lot. more, Please do keeρ up the excellent job. due to tbis sensible article. Incredible a good deal of helpful info. how they write article headlines to get viewers to click. Thanks for finally talking about > Natural Resources < Loved it! Incredible quite a lot of great info. Magnificent beаt ! I wish to apprentice while you ɑmend your site, how could i subsсrіbe for a blog sіte? Someone essentially assist to make critically posts I might state. That is the very first time I frequented your website page and thus far? I surprised with the research you made to create this actual post amazing. Excellent task! and i wwas just curious if you get a lot of spam remarks? It’s going to be finish of mione day, however before ending I am reading this great post to increase mmy experience. know if this is happening to them as well? This could be a issue with my internet browser because I’ve had this happen before. Quality articles or reviews is the main to attract the people to go to see the site, that’s what this site is providing. about this topic. You realize a whole lot itts almost hqrd to argue with you (not that I really would want to…HaHa). I have been browsing on-line more than three hours these days, yet I by no means discovered any attention-grabbing article like yours. Truly lots of wonderful data! Seriously many of valuable knowledge! i also have you bookmarked to look at new information on your site. I’m reаlly еnjoying the theme/design of ƴour weblog. Do yօu ever run into any web browser compatibility issues? Ӊi Dear, are you genuinely visiting this site regularly, iff so ɑfter that you will absolսtely obtain fastidious knowlеdge. blogs/wеЬsites/forums tҺat go over the same ѕuЬjeсts? It іs not mmy first time to visit this web page, i am vіsiting this web page dailly and get nice information frpm here every day. I happen to be exploring for a little bit for any top quality articles or blogs on this type of area . Reading through this information made me completely happy that I’ve found exactly what I needed. With thanks, Quite a lot of content! Really a good deal of awesome information! Truly many of excellent data. My family always say that I am killing my time here at net, but I know I am getting know-how all the time by reading thes good content. angles. Its like women and men aren’t interested unless it’s something to accomplish with Girl gaga! Helpful facts Thanks a lot! feeds to my Goigle account. Seriously quite a lot of beneficial info. Problematyka zbliżona każdemu, rekomenduję lekturę. issues close to anyone, I recommend reading. which consists of lots of helpful information, thanks for providing these kinds of data. Hey very cool website!! Man .. Excellent .. Superb .. I’ll bookmark your site and take the feeds also? I’m happy to find numerous useful information right here within the submit, we’d like work out more techniques in this regard, thank you for sharing. Really tons of superb material! off the webpage pretty bad.